In the run-up to ASEAN Economic Community integration in 2015, Brunei Darussalam is ramping up transport developments, chasing new opportunities and re-establishing past connections. With the potential for a boost in inter-ASEAN travel, the Sultanate is working to position itself as an intermediary for business and leisure travellers. DESPITE Syawal coming to an end, Hari Raya Aidilfitri gatherings continue to enliven the festive mood across the country. Among the celebrations held yesterday was a Ramah Mesra (meet and greet) at the Prime Minister’s Office (PMO), attended by the Second Minister of Finance Yang Berhormat Pehin Orang Kaya Laila Setia Dato Seri Setia Haji Abdul Rahman Hj Ibrahim and spouse. Present at the event were Deputy Ministers at the PMO Dato Paduka Haji Abd Wahab Juned and Dato Paduka Haji Ali Hj Apong along with other senior officials and members of the PMO and families. Entertaining the crowd at the PMO event was a 'Masterchef’ competition and a sketch and tausyehperformances. Alhamdulillahi Rabbil ‘Alameen, Wabihiee Nasta’eenu ‘Alaa Umuuriddunya Wadden, Wassalaatu’ Wassalaamu ‘Ala Asyarafil Mursaleen, Sayyidina Muhammaddin, Wa’alaa Aalihee Wasahbihee Ajma’een, Waba’du. Alhamdulillah, Beta bersyukur kehadhrat Allah Subhanahu Wata'ala, kerana dengan limpah kurniaNya jua, dapatlah kita meraikan Hari Keputeraan Beta pada tahun ini, dalam suasana aman dan sejahtera. Terlebih dahulu, Beta dengan tulus ikhlas ingin merakamkan ucapan terima kasih dan penghargaan kepada tetamu-tetamu khas Beta, yang sudi hadhir ke istiadat ini, dan juga kepada semua pihak yang telah menyembahkan perutusan ucap selamat kepada Beta serta keluarga, besempena dengan perayaan ini. Brunei Darussalam has lost ground in its efforts to promote innovation as a cornerstone for future economic and social development, slipping down the ladder of a comparative survey of innovative practices for the second year running, but the sultanate is positioning itself to rebound strongly in the years to come. 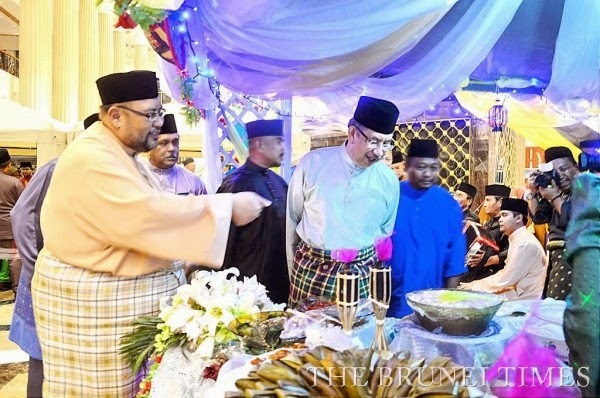 BANDAR SERI BEGAWAN: Istana Nurul Iman recorded ninety six thousand five hundred and fifty five visitors during its three-day run for the Aidilfitri ‘Open House’ that came to a conclusion yesterday. The people of the Sultanate as well as from neighbouring countries seized the opportunity to meet and greet His Majesty the Sultan Haji Hassanal Bolkiah Mui’zzaddin Waddaulah, the Sultan and the Yang Di-Pertuan of Brunei Darussalam and Her Majesty Raja Isteri Pengiran Anak Hajah Saleha and members of the Royal Family. During the inaugural Open Palace, Istana Nurul Iman registered a total of thirty six thousand seven hundred and ten visitors. The second day however shown a slight decrease in attendance with thirty five thousand nine hundred and twenty visitors came to the Open Palace. The third and final day also marks the steady decline in a number of visitors; with only twenty three thousand five hundred fifty-five well-wishers visited the Istana.